Adapted aquatic opportunities cater to a wide range of patrons. Although the phrase “adapted aquatics” typically conjures up images of older adults and persons with significant disabilities, it also applies to a child with arthritis, an athlete recovering from an injury, an individual with autism, or an adult caring for a parent. Since most facilities cater to those with willing and strong bodies, through athletics, fitness classes, and events, these same facilities that don’t consider participants that have the will to achieve without equally strong bodies will be missing opportunities. Know the water temperature at the facilities before approaching other agencies. This information will dictate what clientele can use the facilities as well as which activities can be conducted. 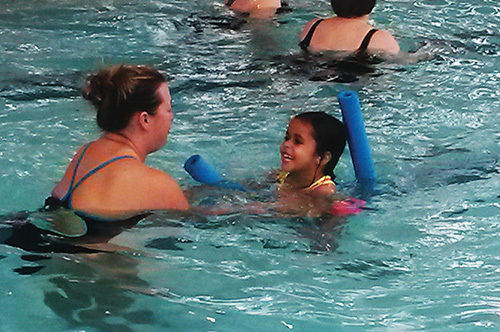 Swim lessons may require one temperature while a therapy center may require another. Visit www.myworldtrs.com/Aquatics.html for water-temperature guidelines. Introduce yourself to occupational therapy, physical therapy, speech therapy, and recreation therapy centers in the area. Many centers have someone who is certified to conduct aquatic therapy or exercise. Consider adapted swim lessons as an opportunity to offer a new program. People with experience in working with those with disabilities and also have swim lesson certification make great instructors. Note: Merely because someone is a therapist does not mean that person is certified to teach swim lessons, however. There must be an additional training certification through a governing agency. Hospitals and children’s hospitals in the area are great contacts. They are often looking for a pool to offer aquatic therapy. Some participants will drive more than an hour one way for a great therapist. After all, it is less expensive to rent a pool than to build one. Local and state agencies dealing with specific disabilities and that also have support groups are great contacts, both for marketing new services as well as identifying a need in the community. Agencies like the Arthritis Foundation offer exercise-program certifications, and are often looking for facilities to host classes. Special Olympics organizations are always looking for aquatic partners, and they provide coaching information and training. Designating certain times and space in a pool for water walking is an easy option. Be familiar with the state’s public-record policy. Most public agencies’ records are open to the public upon request. Since you do not want confidential documents subject to this policy, facility rental may be an option instead. When contracting with an instructor, follow the same policies and procedures as with any other contractor. Work with staff members and/or bring in a trainer to educate the staff about persons with disabilities and customer service. Ask the contracting agency or contractor if this can be done to contribute to the success of the partnership. Ask to see current certifications for the instructors or therapists conducting business in the facility. Know the boundaries of an insurance policy for a contractor or a renting agency. If an outside agency carries the insurance, then continue to do so. Work within the current safety procedures. Adapted aquatic opportunities are developed over time by engaging in the general community, working with individuals in the disability community, embracing education experiences, and marketing programs. Remember to include all of the patrons and not just those with super-athletic abilities. Even super heroes fall and need help to get back up. Dawn Lewellyn , CTRS, WSI, AAI, is an Arthritis Water Exercise Instructor - Owner/Therapist at My World Therapeutic Recreation Services, LLC in Clearwater, Fla. Reach her at dawn@myworldtrs.com or (727) 641-5778.